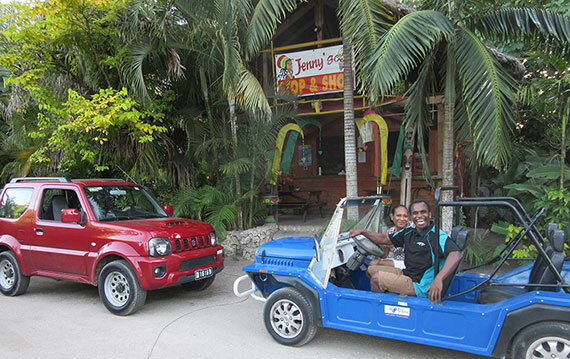 Driving in Vanuatu is unlike driving at home. In fact it is unlike driving anywhere. To start we drive on the right hand side of the road and driver is on the left of the vehicle. Speed limit is 50km around town and 80km is the maximum in outer areas. So it’s not fast, and just as well, because once you have achieved the idea of driving on the wrong side, you then have to navigate the pot holes, the other drivers, poor road marking/signage and pedestrians. Public transport in Port Vila is mainly by small buses and there are lots of them. The condition of the road changes throughout the year subject to budgets within the government, however being tropical when it rains it really does pour! And our roads are washed away. It is highly recommended to hire a 4 wheel drive vehicle, if only for safety and comfort. The other up side of this is that you really can explore. Although the ring road around the island was sealed in 2011 it was also damaged in some areas by cyclone Pam, March 2015. It is also the only ring road that is sealed. Anywhere that is of interest is surely accessed by a dirt road and as insurance does not cover wheels, tyres, undercarriage or windscreens it can be a very costly decision to take an unsuitable vehicle to these areas. The island is 136kms around and although that doesn’t sound like much it really takes a couple of days of adventuring to enjoy the best of it and see all the hidden gems. Fabulous restaurants for lunch and several local food houses. There is a Blue Lagoon, Turtle Beach, hot springs, waterfall, World War Museum and Havannah Harbor to name just a few. Paradise cove, Pango for great surfing and Honeymoon beach are in an altogether different direction. So come and explore, take it easy, take it slow. Paradise is not to be rushed. Enjoy the pace of Island time!